Happy Tuesday to My Friends! I am blessed to be surrounded by wonderful girlfriends and I love celebrating birthdays with them. This card went to my sweet friend Melinda on her birthday. She is BE-YOU-TIFUL so the sentiment was perfect. 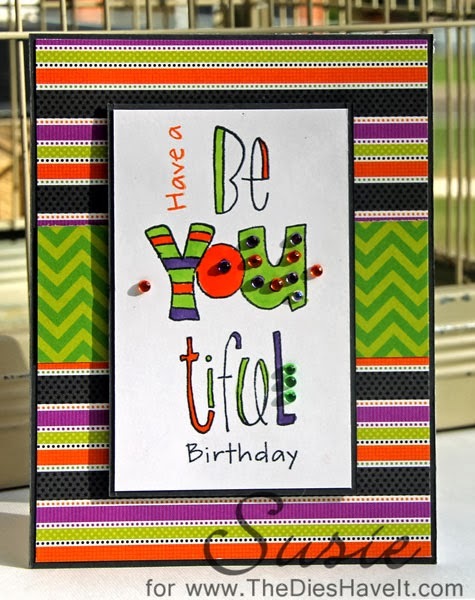 The "Have a" and "Birthday" are from random stamp sets from MFT Stamps. 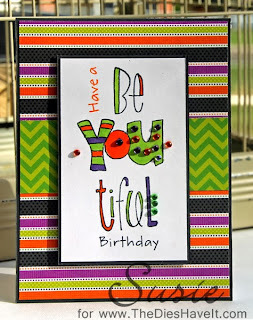 The main sentiment is also from MFT Stamps and comes in a line - but I cut it apart to use as a vertical saying. I chose my paper from Bo Bunny first and then it was easy to select Copic colors and gems to match the papers. I hope you like today's card. I've loved sharing it with you.